Immobilise the vehicle where it does not block traffic: the ground must be level, stable and not slippery. Apply the parking brake, switch off the ignition and engage first gear * to block the wheels. Check that the parking brake warning lamps in the instrument panel come on. The occupants must get out of the vehicle and wait where they are safe. 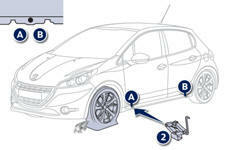 Never go underneath a vehicle raised using a jack; use an axle stand. Remove the bolt cover from each of the bolts using the tool 3 (according to equipment). Fit the security socket 4 on the wheelbrace 1 to slacken the security bolt (if fitted). Slacken the other bolts using the wheelbrace 1 only. 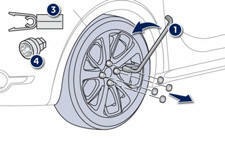 Place the jack 2 in contact with one of the two front A or rear B locations provided on the underbody, whichever is closest to the wheel to be changed. Extend the jack 2 until its base plate is in contact with the ground. 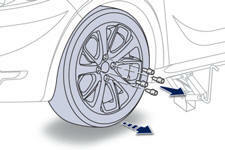 Ensure that the centreline of the jack base plate is directly below the location A or B used. 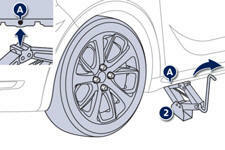 Raise the vehicle until there is sufficient space between the wheel and the ground to admit the spare (not punctured) wheel easily. Remove the bolts and store them in a clean place.